Home of the red panda, black khaleej peasant and the yellow-necked woodpeckers, the fascinating mountain trail up to Dzongri is a trekker’s delight. In the season, the slopes are aflame with great varieties of rhododendron. Situated at an altitude of over 3962 m, it offers the most fascinating view of the Khangchendzonga massif. Sunny, crisp mountain air or swirling mists it’s magical up here anytime. Rhododendrons drench the glades, Just opposite is the Pandim Peak (6890 m) cloaked in thick snow. At Tsoka, before Dzongri, the villagers are prosperous and the fields well maintained; some of the villagers are said to have traveled to Switzerland to learn about high altitude farming. So now they’ve set up ginger, potato and cabbage farms. About 7 km way from Dzongri is the Khangchendzonga base camp established by Darjeeling’s Himalayan Mountaineering Institute. Bakkhim: Bakkhim, the base for Dzongri, is a feast for the senses with more than 20 varieties of rhododendron. The lush green environs are a riot of colours and medley of shades. Bakkhim is also the base for mountaineers and trekkers going to Dzongri 10 km away. Take time to breathe in the scented air and enjoy a few moments alone soaking in this serenity. 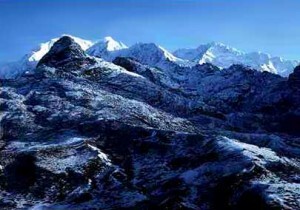 The crisp air charges you and the close-up views of the Khangchendzonga range mesmerize. Tashiding Monastery: This Monastery is constructed on top of a heart – shaped hill with the backdrop of the sacred Mt. Khangchendzonga. The monastery, however, was built in 18th century A.D. Tashiding is also famous for the most holy chorten known as “Thong – Wa – Rang – To” which literally means “Saviours by mere sight”. Another important frature of Tashiding is the sacred water festival popularly known as “Bhumchu”. It is religious trading unique to Tashiding Monastery only. This entry was posted in Dzongri, Sikkim and tagged City, Monastery, Trekking. Bookmark the permalink.